The Lower-Frame-Only bulk bag unloader design can be used with two loading methods. The first is by fork truck. The operator will either put the bag straps directly on the forks of a forklift, or if a lifting frame(a.k.a. Universal Pick-up Device or “UPD”) is supplied (which we recommend) place the straps onto the designated hooks of the UPD and then use the fork truck to lift the bag over the bag pan for unloading. This design can also be used when the facility already has an I-beam with hoist & trolley installed above. Another design feature this style may include is a bag break. When non-reusable flat bottom bags, which do not utilize a discharge spout, are used, a bag break pierces the bag to discharge the material. Most Economical Option: This is as basic as a bulk bag unloading frame can get. It’s only half of a frame, so by that fact alone you save on the upfront equipment cost. 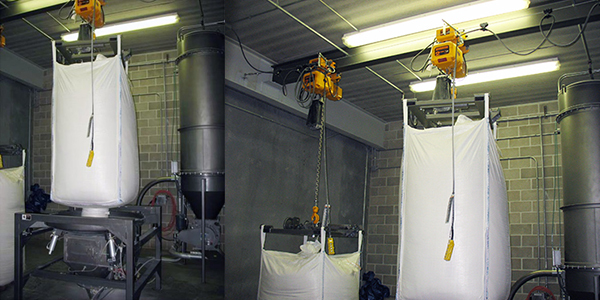 Increased Production Efficiency: In the image above you can see that there is a 2nd hoist with another full bag in waiting, so when bag one is completely discharged you can immediately load the next bag increasing production. Versatility of Use: Not only can this style be loaded by either fork truck or hoist and trolley, it accommodates any bag height without adjustment to the frame. If you use a fork truck to load this frame style, you have to keep the fork truck there during the entire unloading process. 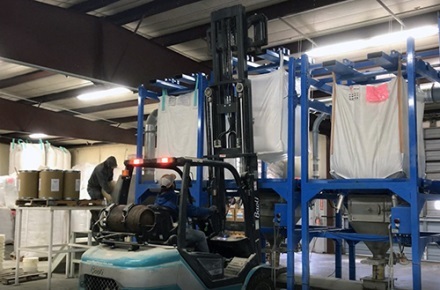 This increases bag change over times, and takes away from being able to use the fork truck for other tasks while the bulk bag discharge system is in operation. If you use a hoist version, you need a roof structure or other support that is capable of holding the weight of the beam and bag(s). Fork Truck Loaded bulk bag unloaders are a full frame design. You place the bag on the lifting frame/UPD, then lift the bag into place over the discharge pan. The upper frame is adjustable to accommodate a range of bag heights. The design usually includes an untie box where the operator can access the bag spout for untying, while keeping the material and potential dust contained. Users often underestimate the height requirements. Bags are loaded into the frame from the top side. In doing so the fork lift mast extends far above the top of the unloader frame. Room must be left for: the untie box, the resting pan, clearance for placing the bag into the pan, the bag height, the strap height, the height of the forklift mast when placing the bag. The result of this is that a 5 foot tall bag may still need 14 feet of ceiling height or more in the installed location for operation. A Forklift is needed to load and unload bags. If it is located in a high traffic area, an upper mezzanine level or an area with tight floor space, this may create an issue. 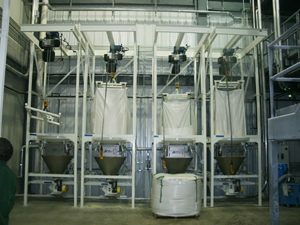 If the bulk bag unloader is loading by gravity into a process, such as a mixer or packaging machine or reactor of some sort, the overall stack-up can sometimes reach 20 feet or more. This is often higher than a forklift mast can reach or an operator can place without difficulty. The Hoist & Trolley bulk bag unloader offers the most benefits of the 3 different frame styles. The operator lowers the hoist to just over the bag so the bag loops can be attached to the UPD. The bag is lifted up and into the frame then lowered onto the bag pan to be untied and dispensed. Increased Safety: You don’t have to use a fork truck. A pallet jack can bring bags to the area, then the operator can stand to the side of bag and easily lift and set it in place with the push of a few buttons on a pendant. Cleaner bag change overs: When you are changing out an empty bag, the hoist and trolley offers better control of the bag. Thus you can maneuver it at a steady speed resulting in less dust when lifting and lowering when compared to a fork truck. Increased Production Efficiency: The hoist and trolley allows you to increase your production efficiency. Not having to tie up the use of a fork truck allows operators to focus on other tasks during bag change overs. The hoist and trolley option also allows a bag to be in waiting so as soon as the empty bag is removed the next full bag can be attached and loaded into the frame more quickly to begin the next discharge cycle. Biggest drawback on the Hoist & Trolley frame design is the upfront cost. Even though in most cases it is well worth the upgrade, it still can increase the initial cost of equipment by as much as 40% . An integral hoist on a framework may require a beefed up frame to lift the cantilevered load of the bag while it is lifted. Additional height may be needed to mount the I-Beam, hoist and trolley above the full framework. Depending on your application needs, facility layout, and production rate, you should select the right frame design for your needs. 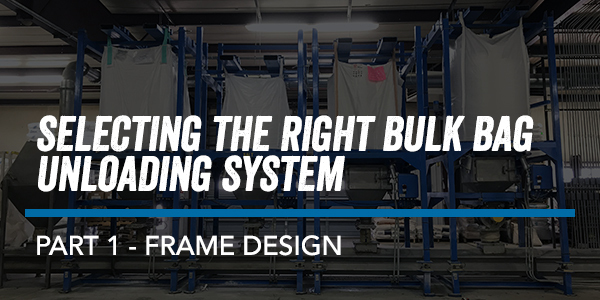 Now that we have covered the foundation of the bulk bag unloader frame, stay tuned for our next blog on all of the options you can add! If you would like to discuss an application at your facility for a bulk bag unloading system, please don't hesitate to contact us.